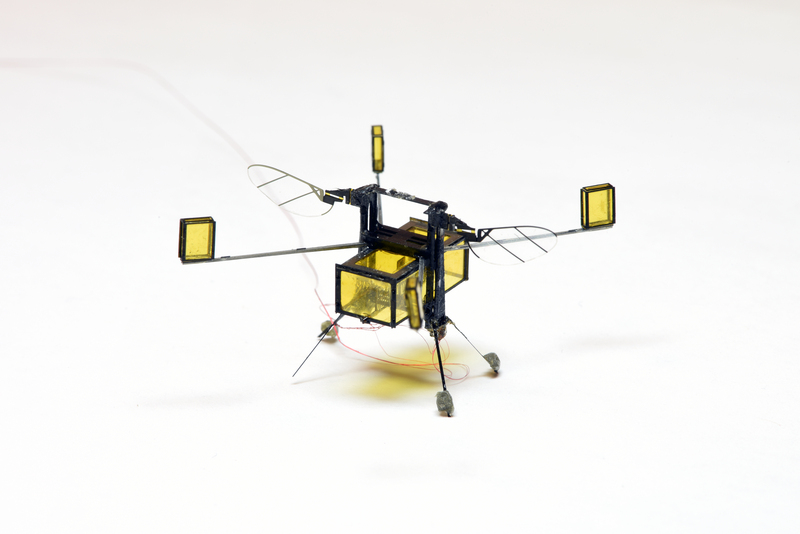 We’ve seen RoboBees that can fly, stick to walls, and dive into water. Now, get ready for a hybrid RoboBee that can fly, dive into water, swim, propel itself back out of water, and safely land. New floating devices allow this multipurpose air-water microrobot to stabilize on the water’s surface before an internal combustion system ignites to propel it back into the air. 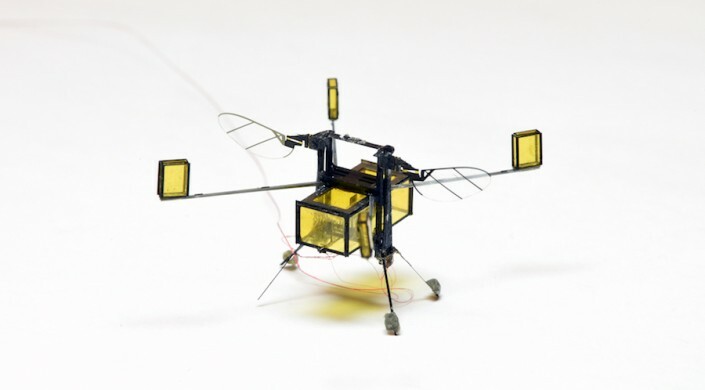 This latest-generation RoboBee, which is 1,000 times lighter than any previous aerial-to-aquatic robot, could be used for numerous applications, from search-and-rescue operations to environmental monitoring and biological studies. The research is described in Science Robotics. It was led by a team of scientists from the Harvard John A. Paulson School of Engineering and Applied Sciences (SEAS) and the Wyss Institute for Biologically-Inspired Engineering at Harvard. Designing a millimeter-sized robot that moves in and out of water has numerous challenges. First, water is 1,000 times denser than air, so the wing flapping speed must will vary widely between the two mediums. If the flapping frequency is too low, the RoboBee can’t fly. If it’s too high, the wing will snap off in water. By combining theoretical modeling and experimental data, the researchers found the Goldilocks combination of wing size and flapping rate, scaling the design to allow the bee to operate repeatedly in both air and water. Using this multimodal locomotive strategy, the robot to flaps its wings at 220 to 300 hertz in air and nine to 13 hertz in water. Another major challenge the team had to address: at the millimeter scale, the water’s surface might as well be a brick wall. Surface tension is more than 10 times the weight of the RoboBee and three times its maximum lift. Previous research demonstrated how impact and sharp edges can break surface tension on a RoboBee’s entry into water but the question remained: How does it get back out again? The RoboBee represents a platform where forces are different than what we – at human scale – are used to experiencing. To solve that problem, the researchers retrofitted the RoboBee with four buoyant outriggers — essentially robotic floaties — and a central gas collection chamber. Once the RoboBee swims to the surface, an electrolytic plate in the chamber converts water into oxyhydrogen, a combustible gas fuel. The gas increases the robot’s buoyancy, pushing the wings out of the water and the floaties stabilize the RoboBee on the water’s surface. From there, a tiny, novel sparker inside the chamber ignites the gas, propelling the RoboBee out of the water. The robot is designed to passively stabilize in air, so that it always lands on its feet. Because of the lack of onboard sensors and limitations in the current motion-tracking system, the RoboBee cannot yet fly immediately upon propulsion out of water but the team hopes to change that in future research. The Harvard Office of Technology Development has filed a patent application and is exploring commercialization opportunities. The paper was co-authored by Hongqiang Wang, Noah Jafferis, Raphael Zufferey, Aaron Ong, Kevin Ma, Nicholas Gravish, Pakpong Chirarattananon, and Mirko Kovac. It was supported by the National Science Foundation and the Wyss Institute for Biologically Inspired Engineering. New, hybrid RoboBee can fly, dive into water, swim, propel itself back out of water, and safely land. The RoboBee is retrofitted with four buoyant and a central gas collection chamber. Once the RoboBee swims to the surface, an electrolytic plate in the chamber converts water into oxyhydrogen, a combustible gas fuel. Video of multipurpose RoboBee taking off and landing. Close-up video of RoboBee taking off.